Reactivate Your Account Now !! 1. 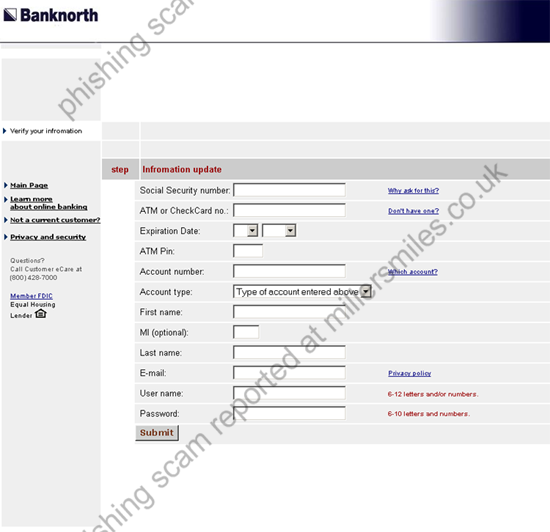 Email claims to be from Bank North asking you to confirm your account data by clicking on the link. You will be taken to a spoof login page where your details will be captured by the phishers. 2. Bank North never send users emails requesting details in this way. 3. URL of spoof website disguised as " Reactivate Now * ". 4. Spoof website traced to Oakville, USA. 5. Real URL obviously NOT Bank North. 6. A big complicated email - full of real Bank North links, and looks fairly professional - but don't be fooled!
" 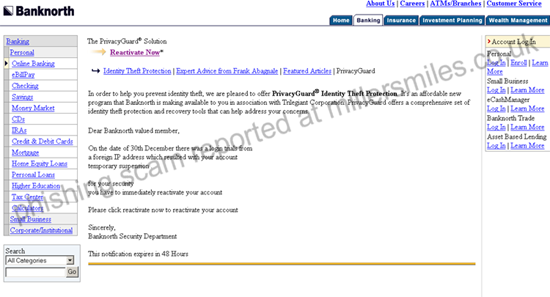 In order to help you prevent identity theft, we are pleased to offer PrivacyGuard "